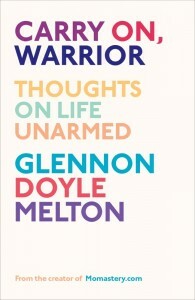 Thanks to TLC Book tours, I am able to give away a copy of Glennon Doyle Melton's Carry On, Warrior. In Carry On, Warrior, Glennon Doyle Melton recounts the stories of her mistakes and triumphs with candor and humor, and gives language to our universal (yet often secret) experiences. She believes that by shedding our weapons and armor, we can stop hiding, completing, and making motherhood, marriage, and friendship harder by pretending they're not hard. In this one woman trying to love herself and others, readers find a wise and witty friend who will inspire them to commit to small acts of love that can change the world. So, how do you enter? It's simple! Just fill out the rafflecopter form below! This giveaway is limited to US and Canada readers only. I really liked Tina fey's book. you have probably read it though. I have read it, but I really enjoyed it! I read it when it first came out, so it has been a couple of years now and I'm thinking I might try an audio version of it next!